The icy road conditions can make for a difficult trip, but you can correct them. You can move the car into the slide by turning the steering wheel. This will direct your wheels to turn as well. In addition, slide correction is an important step, but you should slow down first. When you brake, you should make sure that you don't press down hard as this could get your wheels stuck. 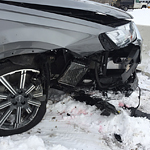 When you want to get a safer vehicle for these conditions, you should visit Ruxer Truck Center.